Teixeira Duarte, founded in 1921, is a Portugal-based conglomerate with significant operations in real estate and construction. Revenues in 2015 were €1.49 billion, down 13 percent from 2014’s €1.71 billion. The company operates in 17 countries, but their main real estate spheres are in Portugal and Brazil, with a smattering in Africa. 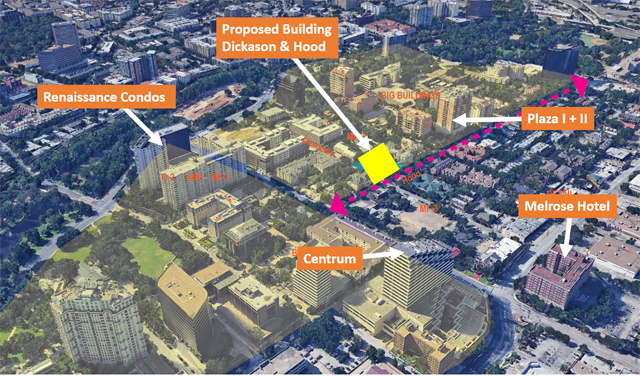 The company intends to construct a residential tower at Dickason and Hood Streets. Award winning, Dallas-based architect Javier Espinoza will design the building currently named Turtle Creek Haus. “Residential tower” could mean rental or condominium, depending on which plan moves forward. Last night at the Reverchon Park Recreation Center, about 30 local residents met with representatives of Teixeira Duarte and Masterplan, as well as architect Javier Espinoza. It was the second meeting with the community.